“Our youth group was going to participate in a dodge ball tournament, but we decided this might be more worthwhile,” said Hannah M., a high schooler from Grimes, Iowa, as she took a break from trimming weeds. 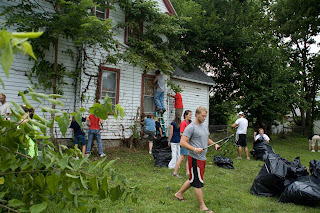 Around her, activity buzzed as students from Indiana, Pennsylvania, and Maryland, in addition to Iowa, worked to cut down a sapling, pulled vines from the side of a vacant house, and scrubbed the inside of a well-used van. Scott Davidson, international director for Soul Winners for Jesus Christ in Dayton, Ohio, believes the young people are a direct answer to prayer. “We have been fervently seeking the Lord for the past seven years, asking God to give us his strength to reach the lost,” he stresses. But it was an e-mail from Ed Lewis, executive director of CE National, which brought a breath of fresh air to a ministry that has worked in a plighted area of the city since 1995. The message brought an offer of assistance – the hands and feet of student volunteers who were attending Momentum, the annual Grace Brethren youth conference which was scheduled to meet at Cedarville University. “I would call them (the young people) an expression of God’s love for Dayton, Ohio,” says Davidson with a warm smile, now standing outside a former crack house on a warm July afternoon. Students from Momentum, now meeting through July 27 at Cedarville University, have come to help. Davidson’s mission involves a variety of activities, including a growing church on North Main Street, feeding the poor, encouraging pastors, and hosting a concert of prayer. He recognizes there are needs to be met while sharing the Gospel with people and for that reason, his organization has been a driving force in revitalizing the Riverdale area, a tired neighborhood nestled at the intersection of I-75 and the Great Miami River. Inside the Gruner Street house that serves as an office for the Soul Winners organization, young ladies were scattered throughout the rooms, hand addressing envelopes that will be used to invite pastors to events over the next two years.